One of the most profound expansions in the Superior Drummer Line. 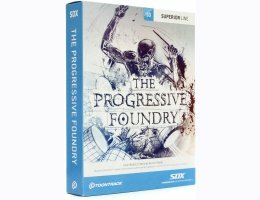 The Progressive Foundry SDX was recorded at the renowned Sing Sing Recording Studios in Melbourne, Australia, by engineer/producer Forrester Savell. With credits on defining albums by Karnivool, Dead Letter Circus and I Am Giant, Savell is not only heralded for having shaped a few of the most sonically progressive productions in the modern Australian metal and heavy rock scene; his forward approach has also brought him to international fame. And it’s not by chance that he picked the Sing Sing Recording Studios for this project. During its more than 35 years in business, the studio has collected a vast selection of top tier microphones and rare outboard gear. Combined with the dense wood-lined walls in its perfectly balanced A-room, Sing Sing has proven time and time again to be the perfect environment for broad, transparent drum recording. The drums, which were sampled by Karnivool’s own Steve Judd, were scoured from all four corners of Australia and present a massive collection of the best in rare, vintage and modern.